This is my third swap and I am enjoying, finding blogs, I have never sen before. The adventure in a new blog and a new recipe is lots of fun. This month, I selected my recipe from Sugar Cookies to Peterbilts. I do what I usually do, jump from one recipe to another and change my mind, each time. I still plan to make a lemon cake, I fell in love with just looking at the photo and a Southwestern salad with corn and black beans. Yummy. Kris must be strong living and working on a farm. She describes all seasons as being difficult so I can imagine, life can be hard but she certainly sounds like she enjoys it. She and her fiancee have cats a dog and chickens. I decided on Gram's Buttermilk Pancakes. I have made pancakes for years but this one was very different than those of my past. There was no butter and no sugar. Healthy - yes. I wondered how it would taste. My husband is my judge and when I saw him put a little maple syrup on this, I decided a little sugar would fit into the recipe but there was no need for butter. This is a healthy and good pancake. I did add almond extract because that is what I do. I learned a wonderful lesson from these pancakes. I can cut fat in a lot of my recipes and I am betting, they will be good. I wouldn't cut all the butter or oil but I can see, using less for a healthier version that is probably just as good. Add eggs, almond extract and buttermilk to dry mix. Mix until combined. There may be a few lumps. Place oil on griddle and heat. I used an ice cream scoop to size my pancakes. They took almost no time to cook. As soon as they pancake bubbles, turn it over and cook for another minute or until brown. 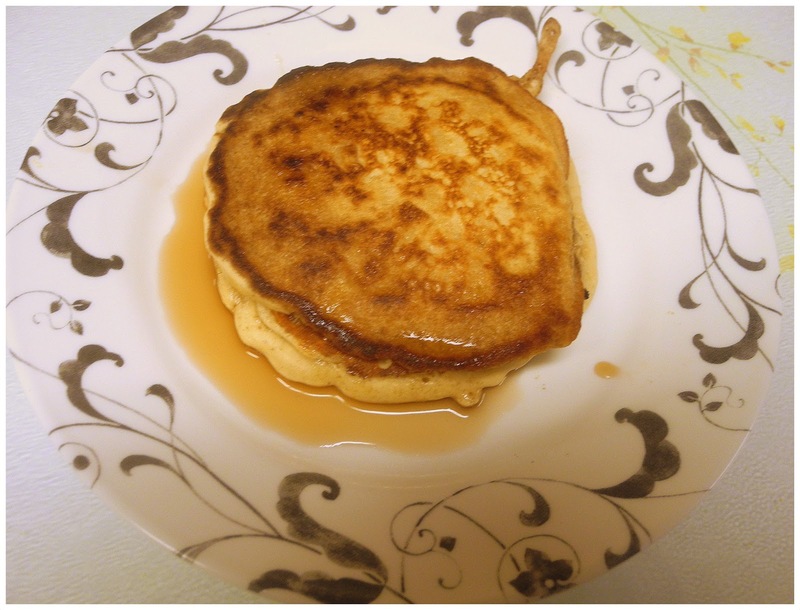 *Buttermilk Substitute: For two cup of buttermilk, add two tablespoon of vinegar or lemon juice to a liquid measure cup. Fill cup to equal two cups, with milk. Going to try your almond extract suggestion!